Take The Floor: Shoes Shoes Shoes!!! 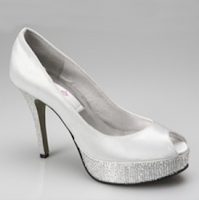 Heels, Flats and More for your wedding and first dance! So you have found the dress of your dreams! You feel like a princess, but there is one thing every princess needs - her glass slippers! There are wedding shoes for every bride these days from kitten heels to killer heels and ballet pumps to basketball pumps! Even Wedding Wellies are seen in outdoorsy weddings (see below left by Weddington Boots) - they would be great for a wedding barn-dance! 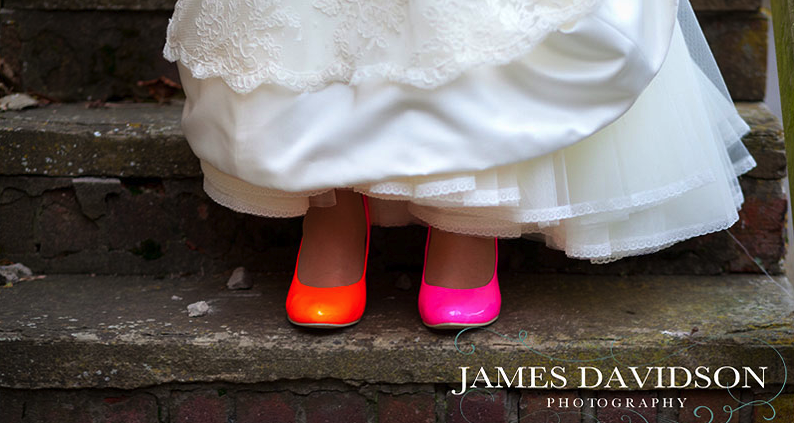 Brides are not always going for traditional white either with an array of colours peeking out of the skirts sweeping the floor. 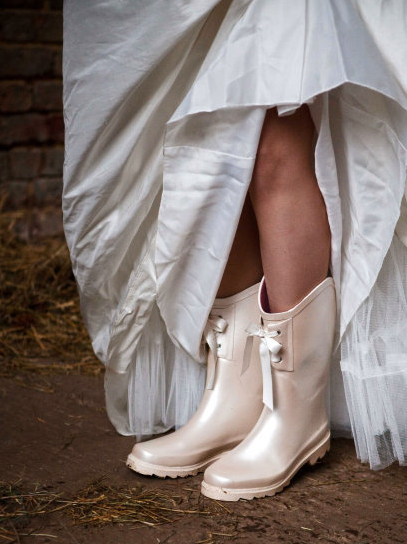 A unusual or statement shoe choice is a great way to add flair and quirkyness to the bridal ensemble without compromising on the traditional white dress. 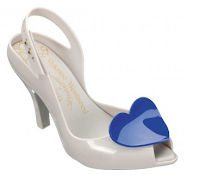 These Vivianne Westwood numbers (below centre) have a real flair whilst still being essentially bridal shoes - they even have the something blue! Comfort must not be overlooked however in the dream for the perfect look. You are going to be in these shoes all day and the you dont want to be hobbling with blisters by the time you get to your first dance! A good rule of thumb is to go with a level of heel you often wear. If you never wear heels then a stiletto is not going to make you comfortable on your day however amazing it makes your legs look - a sprained ankle and a limp will not look so good! If you are not a heels girl there are still some beautiful options - I love these tiny heels (above right) by Irregular Choice. A small platform is actually quite a sensible choice. It gives height and a great heel whilst raising the toe to keep a smaller difference in height ratio between toe and heel. There are some fab bridal designs including these crystal encrusted ones (below left) by Crystal Couture. Be careful of killer heels for killing your new hubby's toes though whilst dancing! 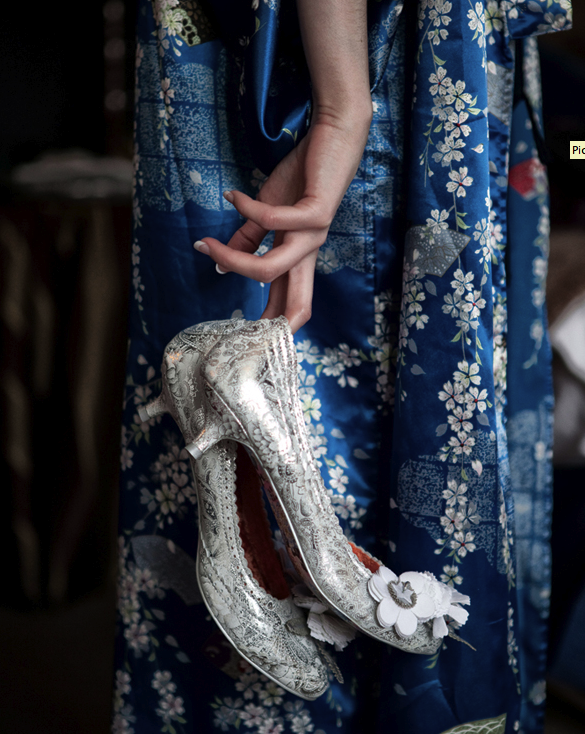 A classic bridal shoe however, and probably my favourite, is the ballroom style shoe. There are some great designs and colours out there but they are designed for maximum movement and comfort as well as a flattering but manageable heel. 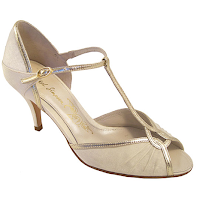 They will stay on too with decent strap designs - no flinging the slingback across the dance floor! I love these Mimi shoes by Rachel Simpson (below right). Available in pink too! They give the feel of special occasion! If you are not used to wearing them they can be very uncomfortable. If there is any outside activity ie photos the heel could sink into the grass making it awkward to walk. Treading on the groom's toes during first dance could be painful! Heels could catch on the dress and rip it. No worrying about sinking into the grass outside. You can dance all night! Flats - ConsThey can make legs look shorter and thicker. They are sometimes harder to find than heels. They are not quite as effective in photographs. This does seem like the ideal solution - to change half way through from heels into flats. 75% of the brides I have asked have said they intend to change them at some point in the day. Do bear in mind though the length of your dress. If it has been fitted to touch the ground in heels you my be tripping over it in flats. One last thing to remember is to practice your First Dance in your shoes! Whether the actual shoes (there is no actual rule about the groom not seeing the shoes before the day, although many would count shoes as part of the dress), or a similar style shoe and heel. It does help the groom to practice in his shoes too. Plus the added bonus of a little breaking in of the footwear to try and avoid new shoe blisters on the big day. I love the quirkyness of these shoes! I am going to change to flats but as strange as this sounds I dance better in my heels. We are doing the quickstep for our first dance and I just seem to do it better in them. I would recommend any one to take dance lessons though as we have both thoroughly enjoyed them and will be carrying on after the wedding too. Even with limited mobility our dance teacher has made a routine that we can do and has shown my partner how to move me about without putting stress on me. The only thing I would say is make sure that the dress doesn't drag on the floor when you change to flats but isn't too short when you have heels on.